Stand out from the crowd and stay ahead of your competition. Innovative lighting can create a professional image and desirable brand. Whether it’s branding, advertising or experiences you are looking for, the latest technology of lighting through walls, ceilings and floors are the answer. How can light help with branding? First impressions only happen once. Whether it is your head office, flagship store, restaurant/bar/hotel, medical facility or educational establishment, light can change how you are perceived. Animated walls bring rooms to life, ceilings mimic the sun’s natural light cycle and carpets deliver important information. These offer employees, patients, students and guests a more comfortable and informed environment. Transparent LED screens offer businesses and designers the ability to present UHD visuals without obstructing the view of merchandise, stages, shop floors or restaurants. The Internet of Things (IoT) is everywhere, but what does it really mean? One day, all machines will talk to each other and enable us to live more efficient lives. Lighting is already capable of amassing data that helps with space optimization, energy usage, temperature control and way finding. LiFi can give you internet access in places currently forbidden due to security risks. Using your carpets to greet visitors, attract customers or show people the way, is a cutting edge method to inform, excite and impress like never before. Static messages and shapes or scrolling messages can be easily programmed from a tablet, PC or phone. Luminous Carpets combine innovative Philips LED Lighting technology with resilient but luxurious Desso carpet that can be installed anywhere. The result is a durable and stylish flooring solution that transforms the way we interact with our physical environment. OneSpace luminous installation liberates you from the constraints of conventional ceilings. They allow for uncluttered minimalistic visions that can transform any interior into a single cohesive space. The hidden LEDs within a OneSpace panel help to spread light evenly through the surface to deliver illumination that is comparable to daylight and even enhances room acoustics. Its minimalistic modern look, super thin edge and invisible light source, integrates discreetly with ceiling architecture. OneSpace, available as both made-to-measure and pre-fabricated ready to install versions, allows you to re-think the ceiling. 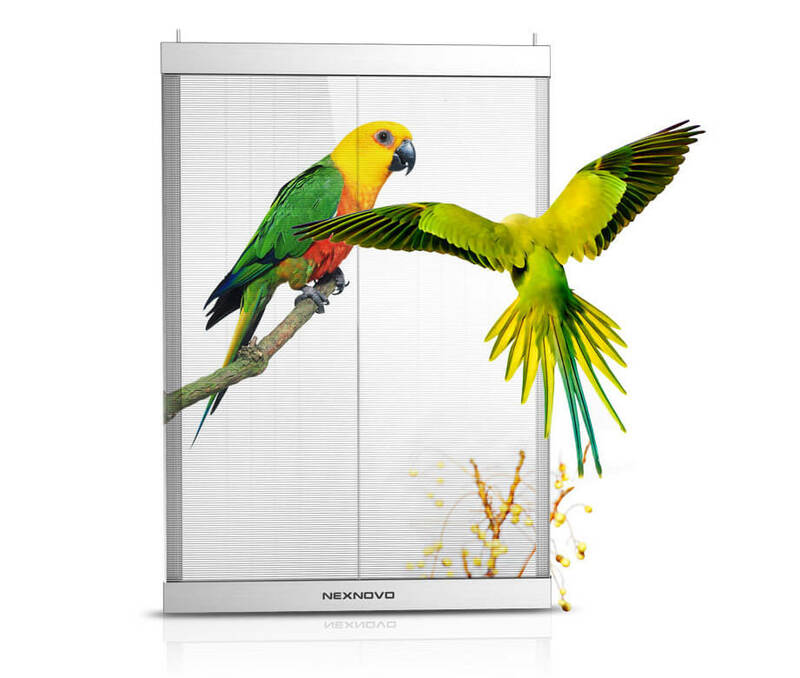 The latest innovation to sweep Europe is NEXNOVO’s 65-90% transparent LED screens that run video in UHD. It’s ideal for Retail environments or anywhere where information or video is required with minimal obstruction. The display when off is almost invisible from 3 metres away. Content managers have complete freedom to upload all content, either on site or remotely using cloud software. Screens are available in digital poster sizes for hanging in shop windows or in modular blocks allowing you to build screens as large as your imagination. Extremely energy efficient, minimal power is required to run the units and they can be used in direct sunlight (6000 nits). Lifetime ranges from 50K hrs – 100K hrs depending on usage. Connected lighting technology has already made its mark in larger corporations. But why should only they get all the benefits? Small and medium enterprises can now motivate employees and boost productivity by creating a better working environment. Lights can dim or go off automatically when they’re not needed. Employees can personalize lighting settings. And business owners can pick up a whole stream of information on how much energy the are using and the amount it’s costing them. First and foremost, staff get to control their own lighting. They can easily adjust it for the task at hand. Better working conditions mean improved morale and productivity and make it easier to attract and retain the best employees. The next benefit? That’s energy savings. Lighting sensors work with the fixtures to figure out if a particular area is in use or not. And if it isn’t, the lights automatically dim or turn off. That’s less manual switching and more energy. The system can even sense the level of ambient daylight and adjust the lighting accordingly. This helps businesses meet regulatory targets and qualify for green business subsidies. It also contributes to the company image, in terms of commitment to social responsibility. Last, but not least, there’s data. To ensure businesses get full value from their lighting, they can gather and interpret data. With the dashboard, you can interpret a wealth of information, such as energy usage, light settings and automation. And that way, you can take on the role of a trusted advisor. Light Fidelity is a high speed bi-directional communication of data using light. The light is pulsed at frequencies that are undetectable to the human eye and offer a similar user experience to WiFi. The main advantage of LiFi is its security. Using conventional 600x600 light panels or standard down lights, these can modified to provide data transfer through light. Connectivity is constantly evolving and it is predicted that by 2020, there will be 20 billion IoT devices being used globally. With radio frequencies becoming saturated, the light spectrum offers unprecedented bandwidth. The bonus being that the fixtures also will provide excellent illumination and offer a secure environment.